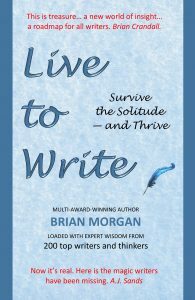 Brian Morgan’s latest book is for writers and is loaded with writing advice like no other. At last – the book that tells us how to banish loneliness, love this writing life and thrive in it. More than 200 top writers and thinkers offer unbounded hope and promise here for writers. They offer life-changing ideas to lift us from good to great, to love our alone time at the desk and fill our days and nights in solitude with triumph. Some of this is memoir – Brian Morgan’s hard-won experience from a long journey. Much of it is the accumulated wisdom of the writing masters. They want to take us on a magic carpet ride to beauty, eloquence and excitement as a writer. • Ways to love our quiet space and lose that sense of isolation. Ways that feed the soul and allow us to be alone, but never lonely. • Where to find the topics that stir the blood, make writing memorable and allow us to reach for the truly great within ourselves. • Discover what would be great for you. What are your dreams? What do you value? What do you believe in? Why do you want to write? Start the journey from good to great by deciding what would be great for you. • Learn how your life and your writing will feed off each other and give authenticity to everything you write – and to produce work that is valued and loved. • Touch the depths of life. Live life, absorb its lessons. Absorb the joy, the pain, the anguish, the exhilaration – all of it. You will be better for it and so will your writing. • Give your readers the full measure of your writer’s heart. Make them feel the emotions you feel. Let them shed the tears you have shed. When all else is done, we all want our words to endure. Find what the masters do to write beautiful words that evoke emotions – and endure. Inside of all writers, there is the desire to be heard, to have our innermost thoughts, feelings and experiences expressed for others to read and to understand. We all want to matter to someone, to leave a mark. This is a book like no other. A book of hope and excitement and value for the writer in you waiting to thrive. The book to take writers from good to great. Why not begin? Begin with this treasure-house of writing wisdom to create the writing life you desire. It will light your way to a memorable writing life. Brian Morgan is worth listening to. In 2018, while writing this book, he received special international recognition when designated as a Global Goodwill Ambassador in consideration of his lifetime of service to community needs. Global Goodwill Ambassadors uphold and support the United Nations Sustainable Development Goals for Human Rights. To buy at Amazon: Live to Write or go to your nearest Amazon book page and type in the book title. Brian Morgan is an award-winning author in the tradition of some of the all-time favorite storytellers. This site, Brian Morgan Books, is where you’ll find stories to touch lives; stories that make a difference. Brian publishes a range of books that look at life from a unique perspective. Each book and each story is written in an easy-read, feel-good style. He uses stories to offer special value, practical solutions and a better, more abundant life. All of his books are based on high ideals, personal values, honesty and integrity. All demonstrate a love of humanity and an ardent desire to leave the world better than he found it. Brian Morgan has an enviable record as a journalist and an author, as international and national awards, widespread testimonials and international reviews clearly demonstrate. Explore the site. Tell us what you think. Contribute. Contact the author. Tell us your stories. This site is ABOUT Brian Morgan and his books, but it is FOR you. Enjoy. The menu at the top of each page is your best guide to the site. The Published Books page has a short description of each book, links to reviews and details of how to buy any book.